It’s rare to say that a business book is a page-turner. But Charles Arthur’s book, Digital Wars, is just that. 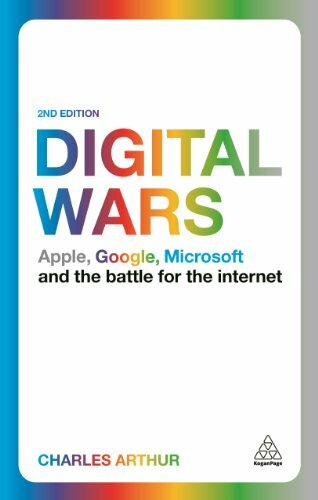 Part of this is due to the subject matter: A look into the battle between Apple, Google, and Microsoft for dominance in the new world of technology, particularly mobile makes for a simply gripping story. But Mr. Arthur then does something unexpected in his book: He breathes life into these billion-dollar companies and makes them . . . human. Digital Wars does more than rehash familiar stories of these industry giants, instead focusing on overarching narratives complete with an accounting of the victories and losses of each. Perhaps because of the recent passing of Steve Jobs, the Apple founder casts a long shadow in the book. As the author recounts each of these battles—computers, search, cloud computing, music, and now the smartphone market—and tallies the winners and losers, the size and scope of how much these companies wagered is staggering. No less staggering are the benefits and costs to us as consumers and as a society. And if these are the titans of the wars, the minor skirmishes involving such companies as HP, Nokia, Palm, and Napster are still compelling, if only for their “what if” value. In the recounting of Ballmer’s many missteps, even Microsoft, long criticized for its behemoth proportions and its near monopolies in certain markets, becomes a sympathetic character. On that point, Digital Wars notes the stark transformation of Microsoft from a programmer’s (Bill Gates) company to a salesman’s (Steve Ballmer) company, while Apple only returns to greatness when its original soul—Steve Jobs—returns to the helm. If you enjoyed Walter Isaacson’s biography of the late Apple CEO as a personal glimpse into the man, Digital Wars is a must-read for a view of Jobs’ doppelganger, Apple, and the other companies that waxed and waned in no small part due to his genius.